Join a full week of intensive kitesurfing in Kite Beach with the team from Kite Verde! The course will allow you to reach a good level in kitesurfing. During your stay, you will be able to enjoy group or private lessons and unlimited use of equipment rental. Not only that, you will also have a chance to explore the beautiful town of Santa Maria. If the wind fails, you can still enjoy a range of alternative activities. You will stay in a very nice guest house ideally located in a quiet Cape Verdean neighborhood, five minutes walk from the center and from the beautiful beaches of Santa Maria. Nearby, you can find all the facilities such as banks, shops, and car rental. You will stay in a single or double room with private bathroom. Daily cleaning, bed sheet, and towels are included. It is a perfect place to enjoy the local life / culture while meeting other kitesurf lovers. 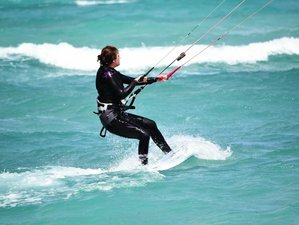 The classes take place with an instructor and one kite per pupil in private lessons or in groups of a maximum of two to three people. Several points are covered: riding safely, going upwind, transitions, tacking, first jump, etc. To progress, what is needed above all is to practice as much as possible. That is why Kite Verde also offers supervised navigation. You are not in class but you will be supervised by a teaching assistant to help you in case of problems. You should be able to go back and forth in both directions and be familiar with safety techniques to be supervised. Expert surfers can enjoy twin-tip freestyle lessons, strapless surf kite, wave coaching, and downwind. You can learn about rotations (back loop and front loop), railey, kiteloop, unhooked, board off, one foot, grabs, etc. You can also have downwind session from Kite Beach to Santa Maria for one hour including the instructor's briefing or from Pedra de Lume to Kite Beach for three hours including transfer and briefing. If the level of the student is not enough to rent, the lessons will be held in groups at the beginning of the week. Over three days, there will be two lessons per day for two hours each. If after the 12-hour lesson you are not yet autonomous, you can be kept under supervision for an additional 10 EUR per two-hour session. Celcio or “Tchatchu” is an IKO kitesurf instructor and photographer from Santa Maria, Cape Verde, who has been kiting since 2014. He has been an instructor since 2015 and teaches various disciplines including kitesurfing, surfing, and SUP with a specialty in bodyboarding. He speaks Creole of Cape Verde, Portuguese, and English. Wagner or “Babotch” is an IKO kitesurf instructor from Santa Maria, Cape Verde, who has been kiting since 2006. He has been an instructor since 2008 and teaches various disciplines such as kitesurfing, surfing, and SUP. Strapless kite with no stress is his specialties. He speaks Creole of Cape Verde, Portuguese, English, French, Italian, and Spanish. Bernardo or “Bena” is an IKO kitesurf instructor from Santa Maria, Cape Verde, who has been kiting since 2012. He became an instructor in 2014 and has since taught various disciplines including kitesurfing, surfing, and SUP with a specialty in strapless kites. He speaks Creole of Cape Verde, Portuguese, English, and French. Odile or “Ody” is the boss of Kite Verde from Rolle, Switzerland, and an IKO kitesurf instructor. She started kiting in 2006 and has been a kitesurfing instructor since 2011. Her kite specialties include freestyle twin tip and strapless waves. She speaks multiple languages including Creole of Cape Verde, French, English, and German. Ricardo or "Guigas" is an IKO kitesurf instructor from Santa Maria, Cape Verde, who has been kiting since 2007. He has been an instructor since 2012 and teaches various disciplines including kitesurfing, surfing, and SUP with a specialty in strapless kites. He speaks Creole of Cape Verde, German, Portuguese, English, French, Spanish, and Italian. This kitesurf camp will take place in Santa Maria, Cape Verde, on the south of Sal Island. Breakfasts will be served during this kitesurf camp. For other meals, Santa Maria has several places for all tastes and prices. You should always drink bottled water and never from the taps. Kite Verde is a kite and surf school offering lessons for all levels, accompanied kiting, gear rental, transfers, storage, kite and board repairs, etc.